The Bolsheviks seized power in 1917. 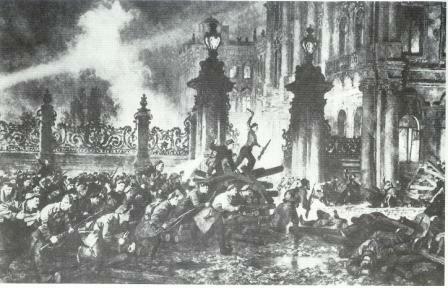 The event of the Bolsheviks coming into power was known as the October Revolution. Prior to this, Lenin had fled to Finland after a failed workers' uprising. Upon returning, he was already sparking a new armed revolution with the slogan "All power to the soviets!" Because of Lenin's writings and speeches, opinions in Russia became more and more geared towards revolting against the provisional government which had been established after the fall of the Czars. Because of the rebellious behavior that was being adapted throughout Russia, this provisional government found it impossible to contain the people, and power simply fell into the hands of the Bolsheviks who had taken complete control. After the dust settled, Lenin was elected leader of the RSDLP and found himself dictator of Russia. Because of the shift of power, Russia now found itself in civil war, which is almost always what happens after a government is overthrown. Lenin&#8217;s communist Red Army was fighting against the monarchist White Army. The war waged from 1918 to 1921, and ended with the Red Army victorious.